US-based Bucketfeet is a footwear company that collaborates with a global community of artists to design limited-edition shoes, spark conversations, and create a brighter world. With Big Apple Buddy’s personal shopping service, you can now buy direct from the Bucketfeet online store anytime, anywhere. The Bucketfeet Decoupage Abstract Barley Blue women's slip on features sleek barely blue leather and the “Decoupage Abstract” design from Uberpup. Bucketfeet empowers artists to share their stories and perspectives using the universal language of art and a shoe as their canvas. 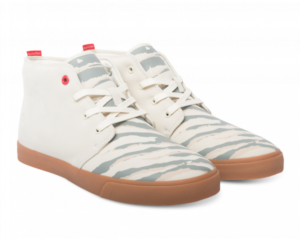 These Bucketfeet Atmospheric Men's Chukka Boot will have you owning your own piece of artwork that you can wear on your feet. When you buy a pair of Bucketfeet shoes, you directly support the artists who designed them. 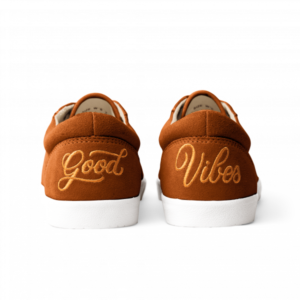 Bucketfeet Good Vibes Chestnut-Colored Women's Lace Ups are the perfect statement shoe. These low-tops might seem like your average sneaker, but will have people turning heads to check out the back calligraphic “Good Vibes". 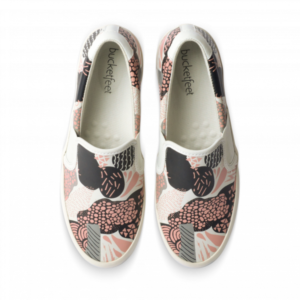 Unfortunately, the USA Bucketfeet online store does not currently offer international shipping. However, Big Apple Buddy, your personal shopper, can help you buy products direct from the official USA Bucketfeet online store and ship them to your doorstep, no matter where you are in the world. We offer international shipping to over 190 countries including Australia, Austria, Bahrain, Belgium, Bosnia & Herzegovnia, Brazil, Brunei, Canada, China, Croatia, Cyprus, Denmark, Estonia, Finland, France, Germany, Hong Kong, Hungary, India, Indonesia, Ireland, Israel, Italy, Japan, Kenya, Kuwait, Lithuania, Luxembourg, Macau, Malaysia, Maldives, Mexico, Namibia, Netherlands, New Zealand, Norway, Oman, Pakistan, Philippines, Portugal, Saudi Arabia, Scotland, Serbia, Singapore, Slovenia, South Africa, South Korea, Spain, Sri Lanka, Sweden, Switzerland, Taiwan, Tanzania, Thailand, UAE, UK and Ukraine. If you would like to buy from the USA Bucketfeet online store, simply let us know which items you would like to order (by filling out the form on the right) and we’ll get back to you with a free international shipping quote within 24 hours!